This patented kit is one of our very favorites, because of the superb quality of the repair, and the satisfaction our customers get when they get rid of unsightly burn holes and other carpet damage. 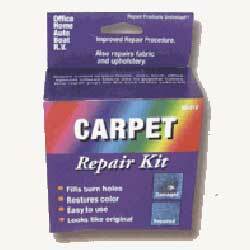 Special Flock Fibers and adhesives, make repairing carpet a snap. Just apply the adhesive, cover with your choice of color and the job is done! You will marvel at how the repair looks just like the original carpet. The kit come with seven special fiber flock colors, adhesive, spatula, and Instructions.